With 2014 being North Coast’s 5-year anniversary and them following through with a commemorative line up as well, it is being assumed that 2015 would be difficult to live up to; and that was exactly the case. Don’t get me wrong, me being the EDM fanatic I am, I saw some names on the line up that get me all tingly on the inside, but looking at it as a whole, it definitely could have been curated a little better. To be fair, it was Labor Day weekend, with other festivals (Electric Zoo, Bumbershoot, Made in America, Sun City, etc) taking place that weekend, traveling and flights are a hassle to go through and I’m sure many artists don’t want to spend their whole weekend flying. Some very notable acts on the line up that really caught my eye and made me want to see them was the Chemical Brothers, Knife Party, Porter Robinson (Live), The Glitch Mob, Chromeo, Portugal. The Man, Tycho, Shpongle, Kill The Noise, Manic Focus, RAC, Jauz, Slow Magic, Snails, Trippy Turtle, Sweater Beats, Salva, Exmag, Wave Racer, Haywyre, HUMANS, amongst others (also if I named some you’ve never heard of, look them up ASAP). This lineup doesn’t cater very much to the mainstream fans, but more to those who have done some digging and branched off onto more diverse and special sub-genres. This being said, this really reflected the attendance of each day and the weekend as a whole. DAY JUAN: To start off the festival weekend, North Coast Day 1 was ahead of us, and it was dead. Just kidding, dead is a slight over exaggeration, but there was a lot less people than last year. The lineup didn’t attract as many people, as expected. To me, I didn’t mind the atmosphere. It was nice being surrounded by people that were there for the music and truly knew something more about the artist rather than the one song they heard from the radio. I arrived on Friday a little late because I have lectures until 3 (damn you education! ), nonetheless I didn’t miss anyone too favored by me. Starting off the day for me was RAC, who is awesome. They give off that indie vibe but is still very much so EDM; also, hearing his remix for ODESZA live was something I’ve been looking forward to for a long time. About halfway through RAC, I hopped on over to Salva to get my dosage of trap for the day. Good thing about Salva is that his trap is the type of trap that is actually enjoyable to listen to. Hearing his remixes of “Kingpin” and “Skyfall” really made it an enjoyable set. After Salva, it was time to spend endless dollars on the grub, just like at every other festival. What really stuck out to me was a particular food truck called “Cheesies.” You can probably figure out where I am going with this… of course, they had cheese like items on almost everything they sold. What really caught my eye was their Macaroni and Cheese filled Grilled Cheese. Let’s just say that it did not disappoint. Grilled cheeses are already bomb as is, put some macaroni and cheese in the middle and we have ourselves a meal. After ordering that, I got my self some of that carbonated water called Perrier because it tastes so good (and because it was free, broke college kid problems). After I filled myself up, I was all energized and ready to go for The Glitch Mob. There was already a buzz in the crowd 30 minutes before they got on. I actually had a man decked out in TGM gear ask me if I have ever seen them before, when I said no, his eyes opened up and he told me “you’re in for a treat,” and man was he right. The Glitch Mob have that added factor of being a live performance. Anyone and everyone can hear if something were to go wrong or if they were a little off sync. This time around, everything was pitch perfect. I’m not sure if it was because I was just so appalled by my first time seeing them or if they were actually that on top of everything, regardless it was an awesome sight to see. The music along with their visuals were spot on. It’s hard to have an act go on after them and do better, but I had some hope. Knife Party have some heavier dubstep tracks that I still listen to this day. So I had very high expectations for their set. People who saw them at other festivals this year were mentioning about how KP is coinciding with the mainstream and playing a lot of big room and over-played tracks, this being said I still hoped for the best. So, it turns out the people were right. I didn’t hear any of my favorite tracks from them, no “Centipede” and no “Give It Up” amongst others. The set was very average and didn’t stand out in any way. Yes it is essential for artists to develop new sounds or try things they’ve never done before, but not try something that so many basic DJ’s do now. Just a very “meh” set in my opinion. If I could, I’d go back and see Slow Magic (which I only heard very good things about). AAAAAND that concludes day one. DAY TOO: THE DAY ALL OF US HAVE BEEN WAITING FOR. Well, most of us that is… Porter Robinson and Jauz. 【＝◈︿◈＝】x (^^^). I arrived to North Coast a little earlier today to catch a set from a group I have recently started getting more into. This delightful duo goes by the name of HUMANS. Their set was everything I would imagine it to be based off the tracks that are on their Soundcloud. I also had the treat of interviewing them, which will be posted up soon. I ran on over to another stage right after HUMANS to catch Jauz. I ended up running their fast enough to catch Sweater Beats finishing up (repping that Boogie Made shirt, so tight). The crowd was filled with Shark Squad, people wearing full shark costumes, you get the picture. I had high hopes going into this Jauz set and man was I impressed. Hearing everything I wanted and more, Sam dropped a VIP of “Feel the Volume” and his (now released) “Deeper Love.” Not to mention he dropped 4 ID’s, which were fairly easy to identify. One was his upcoming collab with Ghastly named “Ghosts n Sharks,” a little play on words in regards to Deadmau5’s famous track; which also, seem to add snippets from that song. The next track was an ID he made with Marshmello, the 3rd was his upcoming remix for Knife Party, called “PLUR Police,” and the last one simply being an ID with no info on it. Overall, easily one of the best sets I’ve seen in a long time. All the hype about this guy is fully backed up wherever he plays. Lots of stuff coming from the Shark Squad leader in the near future. My next hours or so were spent wandering and just hanging out during some sets. Today was a little more packed because of Porter Robinson and Jauz (and Steve Aoki (meh)). Regardless, there was still aplenty of room. Got my bathroom break in, walked around all the vendors in search of pins (so heady bruh), and ate of course. I managed to catch a little of both Manic Focus and Shpongle, both were equally awesome; furthermore, it was nice getting more music in from the wide spectrum we call EDM. Now we came to what can be considered the epitome of the weekend, the climax of North Coast… Mr. Robinson himself. Everyone in the crowd was patiently waiting for him to blow us all away. Certain fans were talking about how “they are ready to bawl their eyes out.” Me being the critic I am, I like to stay in the back of most sets and just absorb everything in, in regards to the music, stage production, light show, etc. So, for Porter Robinson’s set, I found myself directly in front of the sound/light booth, directly in front of the rail that separates the fans from the production crew . What caught my eye along with others was a little family inside the sound booth, on the other side of the rail. It didn’t click until we saw the youngest son wearing a hat with the famous Porter Robinson kaomoji. Porter Robinson’s family had come along with him to North Coast, most likely because it was Labor Day weekend and most of them probably had a free weekend. Here is where you could really tell Porter Robinson has an influential vibe to his music. Fans were expressing their gratitude for his music to his parents, stuff along the lines of how his music takes them to another place to how his music has helped them through the toughest of times. Others were seen giving Porter’s little brothers kandi, custom pins, perlers, etc. Eventually, his family went back up to a raised view from the sound booth to see their son’s set. With that, I was on my way to witnessing my first Porter Robinson set. Good thing about this being the first one was the fact that it was also a live set, adding extra magnitude to what was already going to be a mesmerizing set. The whole set was flawless, everything to his visuals, which were some of the most interesting and creative things I’ve ever seen, to the music itself. Seeing him do his thing up there added extra feeling to an already emotional set. I wish it never ended to be honest. I wish I could go back to that set in a future dream or something. Now with the two biggest names being over with on Saturday, it was time to relax and watch a closer. With this, I chose Wave Racer. His futuristic sound along with elements of bass music really made it a nice way to close the day. His set was very good and something nice to vibe to. Just like that, we were done with day 2. DAY TREE: Too bad the whole festival flooded and we were all told to go home. Just kidding, but I couldn’t attend due to family commitments that were decided upon prior to the weekend. But in all seriousness, my aunt’s car caught fire on the way back home from our trip, so I guess you can say I had a quite “lit” weekend. Regardless, I heard Snails threw down per usual and played that notorious “vomitstep” of his. I also heard very good things about Kill The Noise, who played many tracks off of his recently released album. Really hope I can see Haywyre and Tycho in the near future. Overall, it was a very good weekend. Getting into the festival was a breeze, there were many vendors giving out free drinks and snacks, the refilling stations weren’t too packed (also very accessible), bathrooms were easily available, and the little shops selling miscellaneous items and clothes were separated from the food trucks. Also, the Heineken House looked super cool (not 21 so can’t really give my opinion on how it was inside). 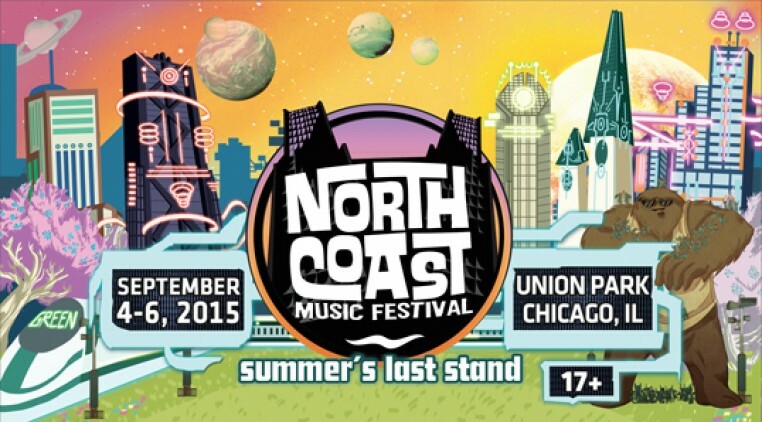 I will always enjoy myself at North Coast, the vibes there are different than all the other Chicago music festivals. The line up is always very diverse and the crowd is always there for the right reasons. Kudos to you North Coast. Thanks to John Zajac for this awesome write up!